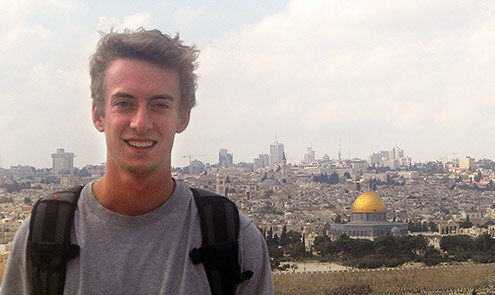 Teddy Aronson, a junior English major from Essex Falls, N.J., is studying in Amman, Jordan, this semester at the University of Jordan. In addition to his coursework, he is spending the semester improving his Arabic and keeping a food journal for Campus Kitchen. Why did you decide to study in Jordan? When I entered Wake Forest, I knew I wanted to take advantage of study-abroad opportunities, but I didn’t know where in the world I wanted to go. My sophomore year, I started studying Arabic and really enjoyed it. By the time I was ready to choose a study-abroad program, the Middle East seemed like a great fit. Here, I can both broaden my Arabic language skills and enjoy the chance to travel to a part of the world I would never have known otherwise. As my Arabic has improved, I’ve been able to take better advantage of everything here in Jordan and in the Middle East. Why are you keeping a blog for Campus Kitchen? I’m a regular volunteer for Campus Kitchen, and Campus Kitchen provided me with a great opportunity. In my blog I explore different Jordanian and Middle Eastern cuisines and their cultural implications. I sometimes get curious looks when I whip out my notebook at the dinner table. In the Middle East, meals are a cherished aspect of family and community life, and each time I indulge I feel as though I’m taking part in a celebration of friends, family and their well-being. The true spirit of the study-abroad experience encourages a cultural component, and I’ve tried to express this using through my posts. It’s been educational experiencing how differently professors conduct their classes here and how students view their studies. Here, much of the learning process is left to the student. American students have had to adapt to this Middle Eastern attitude towards education, and we’ve had to deal with difficult situations like, for example, our professor telling us Monday that our midterm exam would be the next day. It’s also pretty amusing that no one brings backpacks to class. What have you found to be the most challenging aspect of living in Jordan? In America, daily life is streamlined and neatly wrapped. Here, I’ve grown accustomed to preparing well in advance and always looking for what could go wrong in the daily routine. Jordan is still young in areas like technology and transportation. I struggle with unreliable Internet and inconsistent bus schedules throughout a given week. What would you like others to know about Middle Eastern culture? I came to Jordan with an open mind, and the common perception that the Middle East is a tumultuous and chaotic scene is one part of this culture that I have yet to experience. Even during times of elevated tension, such as the recent issue with Jerusalem’s decision to close the Al-Aqsa mosque, the protests in the streets were nonviolent. I was anxious about ‘sticking out’ among the people. But, Jordanians are very welcoming and appreciative of people who take the time to learn their culture and language. Every day I see or experience something that takes me aback and reminds me that I’m far from home. Last week, as I left my apartment for class, I was walking along the sidewalk to catch a taxi, and on my right I could see there was something unusual in our front yard. A Bedouin shepherd had brought his herd of sheep, three dogs and donkey to graze in our area of the city. We exchanged sabaah al-khair’s and continued on with our day. I’ve come across both reassuring similarities to my life at Wake Forest and jarring differences, and I welcome both experiences. My inbox is full of reminders of things I’m missing. It’s difficult to come to terms with the fact that I missed attending Convocation, being an audience member for Chris Paul’s interview with Rick Reilly in Wait Chapel, and hearing Graham Allison speak. Don’t even remind me that I’ve missed the President’s Ball, Hit the Bricks, Project Pumpkin and the football season. The online edition of the Old Gold & Black has been great in keeping me up to date, but it’s definitely bittersweet. What do you hope to bring back with you from your studies? I’ve gained a greater understanding, through my interactions with the Jordanian people, of how the Middle East sees itself and others. My experiences are encouraging me to reflect on my roles as a student and as a member of the Winston-Salem community. I’m looking forward to getting back to Wake Forest and experiencing everything that is yet to come.